This is a guest post by Joey Asher of Speechworks / Asher Communications Inc. He blogs at www.talkingpointsblog.com. 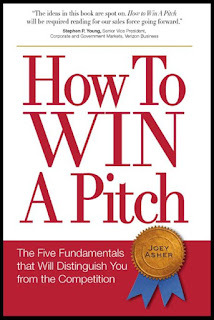 This post is adapted from Joey Asher’s new book “How to Win a Pitch: The Five Fundamentals that Will Distinguish You from the Competition. It is available at www.howtowinapitch.com and on Amazon (pre-order until May 19). When I was in school, I attended many parties where there weren’t enough girls. Competition for dance partners was fierce. That’s what the marketplace looks like in today’s recession. New business is scarce. And competition is fierce. Fundamental #1. Present a solution and nothing else. Many of your competitors start presentations by talking about themselves. “Before we start, let me tell you about how our company began . . .” Blah. Blah. Blah. Who cares? Your prospect only cares about is how you can save them money, grow their revenues, or reduce their risk. Detail your plan to help your prospect and tell stories about how the plan has worked for others. Fundamental # 2. Keep it simple. I watched three construction firms pitch to build a new school. No presentation had less than 10 points. None of the messages were memorable. Instead, you should hammer at three messages. “We’ll build your project on time. We’ll meet your budget. We’ll deliver quality work.” Simplicity separates you from the competition. Fundamental # 3. Speak with Passion. If you’re one of three firms competing, you know that your competition can do a great job. Personal style can be the separator. “When it’s close, many of the decisions just come down to who connects with us best,” one CEO told me. Passion in the voice helps you connect. To read Joey’s blog go to www.talkingpointsblog.com.